The Craighill Channel, so named for William Price Craighill, a key figure on the Lighthouse Board who had supervised the engineering surveys of the channel, forms the first leg of the maintained channel from Chesapeake Bay to the Patapsco River and Baltimore Harbor. The channel leads from the mouth of the Magothy River to the southern end of Belvidere Shoal. The rising importance of Baltimore as a port persuaded Congress to set aside $50,000 in 1870 to widen the Craighill Channel to 500 feet and deepen it to 22 feet. However, without range lights, the channel was unusable at night. 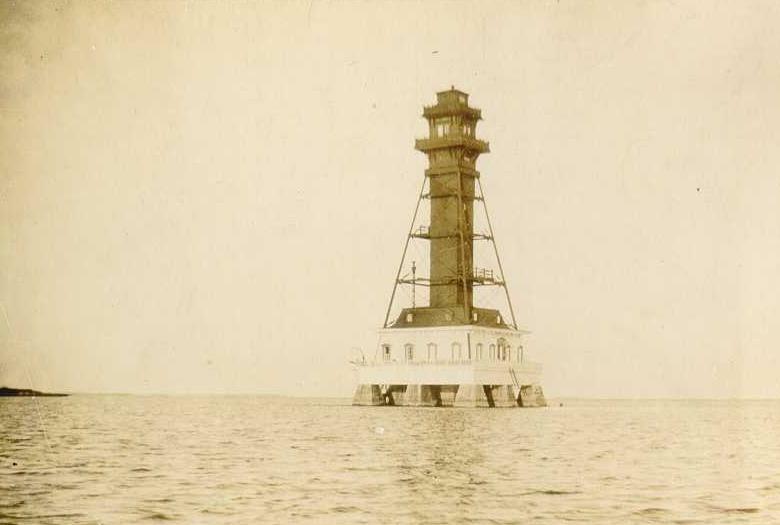 The Lighthouse Board moved to remedy this situation in 1871 writing “this channel has the advantage of saving about five miles in distance to large vessels bound to Baltimore from the lower bay; avoids much, if not all, of the dangers usually experienced from the accumulation of ice in the lower part of the Brewerton Channel during the winter; is much easier navigated, or would be if range beacons were established.” While eventually two sets of range lights would be constructed along the channel, totaling four lighthouses in all and forming an upper and lower range, the original plans called only for the lower range lights. Due to the location of the Craighill Channel, it would have been problematic to construct range lights onshore and so the decision was made to build them on the bay. The original design called for standard screwpile foundations for both of the range lighthouses. However, before construction could begin, potentially dangerous ice conditions at the site of the front range were observed over the winter of 1872-73. This hazard prompted the Lighthouse to alter their plans and construct a small caisson structure for the front range, while using a granite pier foundation for the rear range. Congress approved $45,000 in 1872 for the construction of the two lights. The precise location of the rear light took careful planning to ensure the necessary alignment with the front range light, which was positioned 2.4 miles to the south. Once the location was determined, a sampling of the substratum was taken as noted in the Annual Report of the Lighthouse Board. “A careful examination showed that the soil was firm, hard sand, to a depth of two feet. Below this was a think layer of sand and mud, mixed with stones, then soft mud to a depth of fifteen feet.” Based on these findings, "a pile and grillage foundation became necessary to support the piers on which the columns of the frame-work rest." In April of 1873, a sixty-foot square cofferdam was built around the site in two feet of water, and the interior was then pumped dry. Foundation piles were driven into the muddy bottom, cut off evenly, and topped with a grillage of timbers. Atop this foundation, nine piers, arranged in three rows of three, were constructed of Port Deposit granite to support the lighthouse. Due to the expense of the foundations at both the front and rear locations, the initial funding was depleted before much work on the actual superstructures had started. 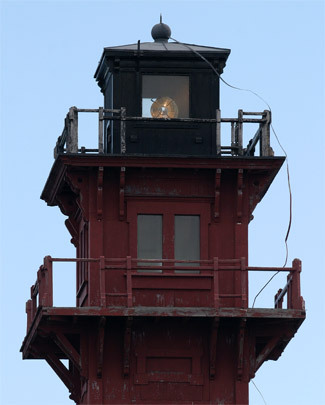 A temporary light was established atop the granite piers of the rear range light on November 20, 1873, and the associated keeper lived ashore in the quarters used by the construction crew. The keeper of the light was forced to live in makeshift accommodations until additional funding was obtained in June of 1874 and the lighthouse was finally completed in early 1875. The lighthouse constructed on top of the granite piers resembled a four-sided pyramid, with the residence located inside the base of the framework. The keeper’s house was a one and one half story structure built in a Victorian style with dormer windows. An enclosed stairway extended from the residence to the elevated service room, watch room and finally the lantern room. A cantilevered deck surrounded both the watch room and lantern room, and a small heating stove was located in the watch room. The tower’s exoskeleton was made of cast iron, while the interior portion was made of wood. 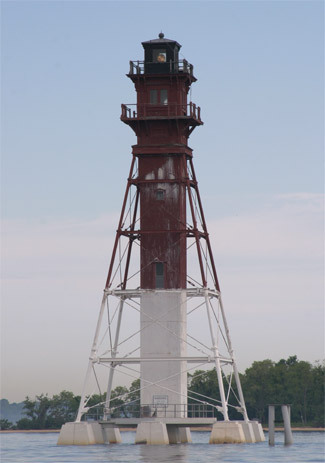 The Craighill Channel Lower Rear Lighthouse measures 105 feet tall, making it the tallest light in Maryland and one of the tallest on the Chesapeake Bay. Housed inside the lantern room is a fourth-order Henry-Lepaute Fresnel range lens. Portions of the annular rings are missing, and the original central bull’s-eye has been replaced by a Pyrex version. According to historical records, extensive repairs, necessitated by the decay of nearly all of the tower’s wooden braces, were made to the structure in 1884. Metal beam braces replaced the wooden ones, and during this work, new boat davits were installed and the entire tower was painted. In the summer of 1888, a cyclone tore away the dwelling’s roof and caused other minor damage to the structure, all of which was repaired that same year. The rear light was converted to acetylene in 1923 and automated. The keeper’s dwelling was then reportedly rented out until it was dismantled in 1938. A Coast Guard engineering survey of the rear tower made on April 20, 1994 reported that the wooden portion of the tower “will rapidly become a serious safety hazard to service personnel” and recommend the Coast Guard “shouldn’t spend any more money trying to maintain it.” Instead, the engineer advised that the wooden stairway should be demolished and replaced with a device to lower the light for required service. To date, the central column of the tower remains intact, and the tower has been determined eligible for the National Register of Historic Places, which may protect the tower from any alterations. “Craighill Channel Lower Range Rear Light Station’s National Register of Historic Places Nomination,” 2002.